"You're in, or you're out." The Orchard has debuted an official trailer for the indie drama-documentary mix titled American Animals, which first premiered at the Sundance Film Festival this year to quite a bit of acclaim. American Animals is the next film from Bart Layton, more of a feature than a doc, but still a hybrid of both, similar to his last film The Imposter. Based on a true story, it stars Evan Peters, Barry Keoghan, Blake Jenner, and Jared Abrahamson as four young friends who try to pull off a poorly-planned heist stealing expensive art books from a university library. Things don't go as planned, and lessons are learned. The actual real people they're playing also appear in the film in various scenes and interviews. The cast also features Ann Dowd and Udo Kier. It's a totally original film worth seeing for its uniqueness. And this trailer is dope! I dig the music choice and how it's all edited together - this is slick. Great way to sell the film. The extraordinary and thrilling true story of four friends (Evan Peters, Barry Keoghan, Blake Jenner, and Jared Abrahamson) living an ordinary existence who brazenly attempt to execute one of the most audacious art heists in US history. But not everything is as it seems, and as the daring theft unfolds through each of their perspectives, each of them start to question whether their attempts to inject excitement and purpose into their lives is simply a misguided attempt at achieving the American Dream. 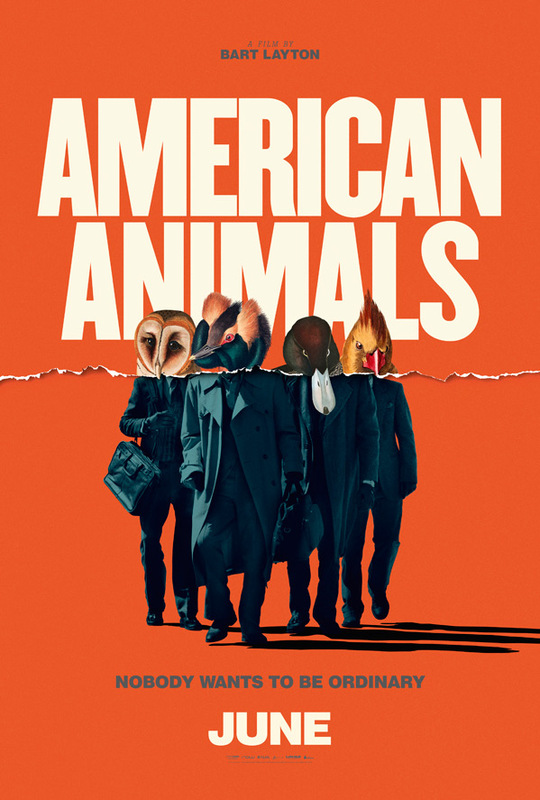 American Animals is both written and directed by British filmmaker Bart Layton, of the documentary The Imposter previously, and the TV docs 16 for a Day and Locked Up Abroad as well. This first premiered at the Sundance Film Festival, and also played at SXSW, True/False, and the San Francisco Film Festival. The Orchard will open Layton's American Animals in select theaters starting June 1st this summer. Who's in?